2012 has clearly become the year of the glitters! There are a ton of brands that now have a wide range of colorful glitters. You know what the best part about this is? They're coming from super affordable brands. I've seen these glitters from Icing, Claire's, Revlon, Milani, and Jordana. I found this Jordana glitter at KMart and it only cost me $2! Copper Blaze is a mixture of large and small copper hexagonal glitters in a clear base. 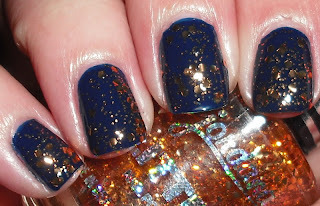 This is a great glitter! I love the color. I do not typically see copper glitters. The formula is excellent. You will not be fishing out glitters in this at all. They glide on to your nail smoothly. I approve! The only thing, is I know online these are $3 rather than $2. If you have KMart in your area, I suggest you go there and stock up on the Jordana glitters they have. You can't go wrong at $2 a pop! Yaaay!! So happy to see this on yout nails! Oh and I cannot wait to meet you this Saturday! OMGZ, I was LITERALLY holding this in KMart yesterday and I couldn't find a price so I didn't grab it. I totally love it on you and now will have to plan a trip (the closest Kmart is not close to me at all :/ ) Super pretty and I love your layering choice! Looks pretty over this shade esp. I am now really appreciating the glitters that don't cover to opaque. I like the bald spots now - using the glitters as a more sparse topper. They are easier to get off that way too. I have so many glitters - high and low cost ones. I keep thinking I need no more, but there is always a new one out there that grabs my attention. Love the dark blue + copper combo! I picked up SOPI Traffic Stopper Copper and went through I phase where I layered it over everything (copper and pastel pink- so amazing, try it!). Even though I got the SOPI on sale, this would have been a cheaper option. Looks lovely!